They are known as "the 102 minutes that changed America." Fifteen years later, it is increasingly clear that the 102 minutes of the Sept. 11 attacks also reshaped and changed the world. Indeed perhaps even more than Americans, Europeans now feel the strongest aftershocks, having been shaken by more than 10 Islamist terror strikes in the past 20 months alone. Hence as America commemorates the 15th anniversary of 9/11, several European countries are intensifying their intelligence activity. In the process, they are discovering more and more terror cells, resulting in multiple arrests Europe-wide just this past week. More are likely to come, particularly in France and Belgium, judging from a recent CNN report which found that the plotters of the Nov. 13 Paris attacks had intended them "to be far worse, to occur in other European countries as well, and, investigators believe, had planned to follow them up with strikes in several locations." CNN also uncovered signs that ISIS was planning to increase its activity in the UK – which may explain the Sept. 8 arrests of two West London men suspected of preparing an act of terrorism and funding terrorist activity. A third man arrested in East London the same day was also taken into custody on another terror-related charge. The arrests follow other raids in Birmingham and Stoke in late August, in which four men were taken into custody on charges of planning a terrorist attack. But ISIS is doing more than planning attacks. It appears also to be exploring new strategies and weapons, according to the 17-year-old son of Belgian imam Shayh Alami. The boy has called for the death of Christians in the past. After his arrest late last month, according to the Mirror, the youth (who has not been named) told police that the terrorist group has begun inciting a kind of Islamist chainsaw massacre, encouraging its European followers to take chainsaws to Christians in shopping centers. 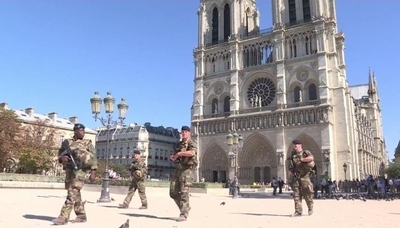 And in France, four days after a car loaded with gas cylinders was spotted parked near Notre Dame Cathedral in Paris, police arrested three women, ages 19, 23, and 39, also on charges of planning a terrorist attack. The arrests, which coincidentally also took place on Sept. 8, soon led to the arrests of four other suspected "radical Islamists," according to the prosecutor's office. At least one of the three women, Ines Madani, reportedly wrote a letter pledging allegiance to the Islamic State and spoke on the phone about plots to bomb Paris train stations. Hence, while the parked car appeared rigged to explode, the New York Times reports, officials clearly found its presence suspicious. In short time, they traced its ties to that phone conversation: the car belongs to Madani's father. Further investigation also showed that the group planned attacks on police in what French interior minister Bernard Cazeneuve described as "new and, moreover, imminent violent actions." Apparently, they weren't the only ones: On Sept. 11, French authorities also arrested a 15-year-old boy on suspicion of preparing "imminent and violent action." Like the women arrested previously, the boy is believed to have had contact with suspected ISIS militant Rashid Kasheem, who is French. Kasheem is now in Syria, but has regularly called for attacks in France, LeMonde reports. Not all the activity in Europe of late has been directly related to attacks, however. Among the lessons learned from 9/11 is the importance of terror finance and the insidious methods through which money is transferred to support terrorist groups worldwide. Tracing those connections remains crucial to counterterrorist intelligence, which explains why Dutch officials last week raided two mosques and several private homes: the mosques and their imams are suspected of laundering money through at least 10 charities. Those charities, the Dutch Fiscal Information and Investigation Service (FIOD) believes, help fund other organizations that, in turn, provide financial support to terrorist groups in Syria, Lebanon, Jordan and the Ukraine. According to a FIOD statement, financial transfers to the mosques and the charitable organizations come not only from the Netherlands, but from Qatar, Saudi Arabia, and the UAE. In addition, FIOD asserts, "One of the suspect foundations has received a transfer of hundreds of thousands of euros from a charitable organization from the Middle East which is connected to a charity that the US has placed on a list of sanctioned groups." The suspects, believed to be Ahmad Salam, his son Suhayb Salam, another (unnamed) son and a fourth party, are also said to have connections to Kuwait's Revival of Islamic Heritage Society (RIHS), which the U.S. Treasury Department designated in 2008 "for providing financial and material support to Al Qaida and Al Qaida affiliates and supporting terrorism." Both mosques, the Al-Fitra mosque in Utrecht and As-Sunnah mosque in Tilburg, have come under fire in the past for preaching Salafism, the extremist form of Islam that some European countries – including the Netherlands – have discussed banning. Last December, Utrecht's mayor also expressed concern about the influence the Al Fitra mosque and Suhayb Salam, its imam, were having on members, and the mosque's alleged efforts to turn Dutch Muslim children against Dutch society. And in 2013, both As-Sunnah and Ahmad Salam were investigated on charges of abusing and beating children during Quran lessons – accusations Salam strongly denied. But there is this that can be said about what has changed because of 9/11: we know more about radical Islam. We know more about what is needed to defend ourselves against it, and to fight it where it rises. The raids and plots of these past few weeks confirm that point. The threat may be greater now, but we are far better prepared than we were on that bright September day to fight it. And we will. Abigail R. Esman, the author, most recently, of Radical State: How Jihad Is Winning Over Democracy in the West (Praeger, 2010), is a freelance writer based in New York and the Netherlands. Follow her at @radicalstates.